Leading U.S. music rights organization Broadcast Music, Inc. (BMI) staged its annual Film/TV Awards tonight at the Beverly Wilshire Hotel in Los Angeles. During the invitation-only gala, BMI celebrated the composers of music featured in the past yearâs top-grossing films, top-rated prime-time network television series, and highest-ranking cable network programs. 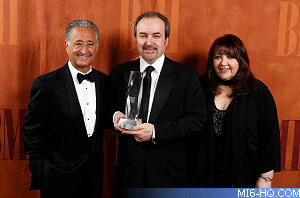 Hosted by BMI President & CEO Del Bryant and Doreen Ringer Ross, Vice President, Film/TV Relations, the ceremony also featured the presentation of the Richard Kirk Award to David Arnold. Above: Richard Kirk, David Arnold Doreen Ringer Ross. David Arnold has composed scores for a diverse collection of films including James Bond installments Tomorrow Never Dies, The World is Not Enough, Die Another Day, Grammy- and BAFTA-nominated Casino Royale, and Quantum of Solace, the Grammy-winning Independence Day, the 2000 remake of Shaft, Stargate, Zoolander, Godzilla, The Young Americans, 2 Fast 2 Furious, Changing Lanes, The Chronicles of Narnia: The Voyage of the Dawn Treader, and so many more, as well as BBC series Little Britain and Sherlock, and British mockumentary series Come Fly With Me.